“Hard, cruel cactus”, according to the authors, “referring to the formidable hooked spines which hold on in a most aggravating manner”. 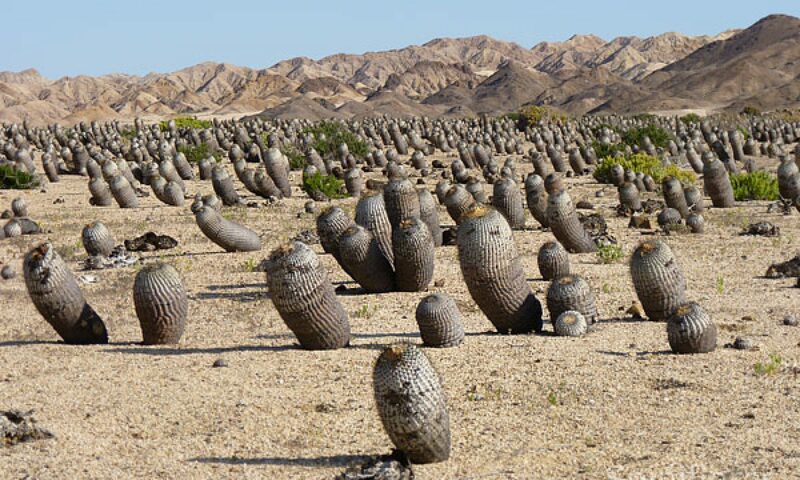 A genus of solitary plants, or forming clumps from the base, globose to elongated more or less cylindrical, the apex usually depressed, with a strongly fleshy and branched or napiform root. Ribs distinctly tuberculate, with dense spination, sometimes completely covering the epidermis, sometimes papery (S. papyracanthus); radial spines spread, the longest central spine almost always hooked. Flowers diurnal, self-sterile, usually rather large, funnel-shaped, some fragrant (S. polyancistrus), yellow, greenishyellow, pink lavender, magenta, purple to purplish violet, sometimes white, pollinated by hymenoptera (Andrena spp., Halictus spp., Tetralonia spp.). Fruits cylindrical more or less elongated, greenish, then reddish when ripe, with longitudinal dehiscence (S. pubispinus), lateral (S. mesae-verdae) or indehiscent. Seeds large, finely tuberculate, shiny, black, with the hilum sunken. Seed dispersal through myrmecochory and hydrochory. 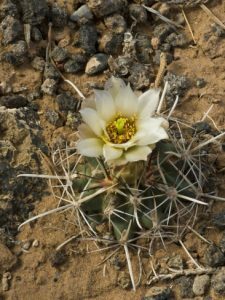 The genus Sclerocactus grows in grasslands, in pine and juniper woods, on limestone, gravelly, alluvial soils (pH 7 to 7.5), in extremely dry areas (Mojave desert) with clayey, powdery sedimentary soils, but also among pebbles of old fossil rivers (San Juan), in the cracks of rocks, in mountains and on hillslopes, sometimes on volcanic rocks (Agathla Peak in Arizona or Mexican Hat in Utah), from 500 m (S. polyancistrus) up to 2350 m in altitude. S. papyracanthus is almost invisible in its habitat, becoming confused with the surrounding grasses (Bouteloua gracilis). Some species of the genus can withstand severe frost: -26°C (Steven Brack, pers. comm.). USA (Arizona, California, Colorado, Nevada, New Mexico, Texas, Utah).